Bozkir Çanavari: The Steppe Monster is the latest of articles available online, written by Guvener Isik in the ASDI newsletter (Anatolian Shepherd Dogs International, Inc., Choban Chatter ). It is an authorized English translation of a chapter from the Turkish dog book, Turk Çoban Köpegi Kangal by Dogan Kartay. Thank you Dogan Kartay and Guvener Isik for doing this work! This chapter explains a little about the mystery and intrigue behind some of the wolf/shepherd dog hybrids of Turkey, the parents of which "can be karabas, akbas or crosses of these two. The possibility of the survival of the cubs from the Çanavar parents is greater in the steppes." 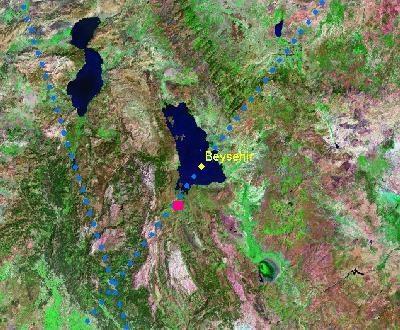 Male Wolf and female Kangal pairs are bred under the control of the villagers of Yesildag region that is in the west of Beysehir Lake, which is located, further north of Toros Mountains. 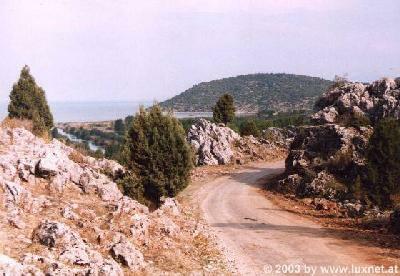 Here's a photo of a twisting, winding road to Yesildag going around Lake Beysehir. Here's a fascinating satellite map which helps put the rough terrain into a little more perspective. 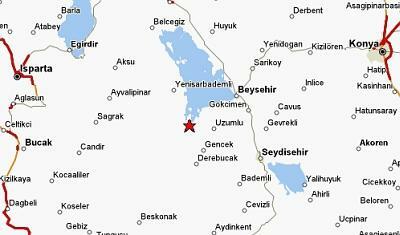 Pink spot is approximately Yesildag. 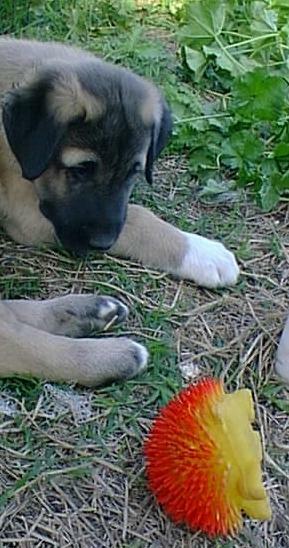 Boone ponders a squeaky toy that is not a Steppe Monster.